The History Colorado Center, the nearly 200,000-square-foot, $110.8 million museum, will open to the public April 28 2012. DENVER – March 26, 2012 – The impact of Colorado’s history, the beauty of art and the wonders of technology will converge with the official opening of the new History Colorado Center in Denver on April 28, 2012; and designer of urban spaces, sculptor and nationally acclaimed public artist, Steven Weitzman, has contributed to this exciting $110 million project by developing the ”Great Map of Colorado”—a 40-by-60-foot terrazzo map of Colorado’s topography that is imbedded into the History Colorado Center’s atrium floor. 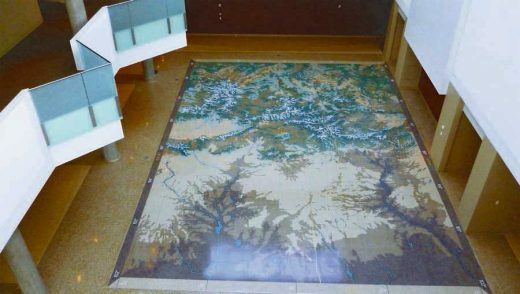 History Colorado commissioned Weitzman to construct the Great Map of Colorado made completely out of FOTERA® terrazzo tiles. The map is located in the History Colorado Center’s four-story atrium. Weitzman and his talented team handcrafted 234 tiles, each being +- 3’ X 3’ X 7/16” in size, with a tolerance of 5/1000 of an inch, and taking over 9,000 man-hours to install—all of which comes together to form a dramatic bird’s eye view of the state. 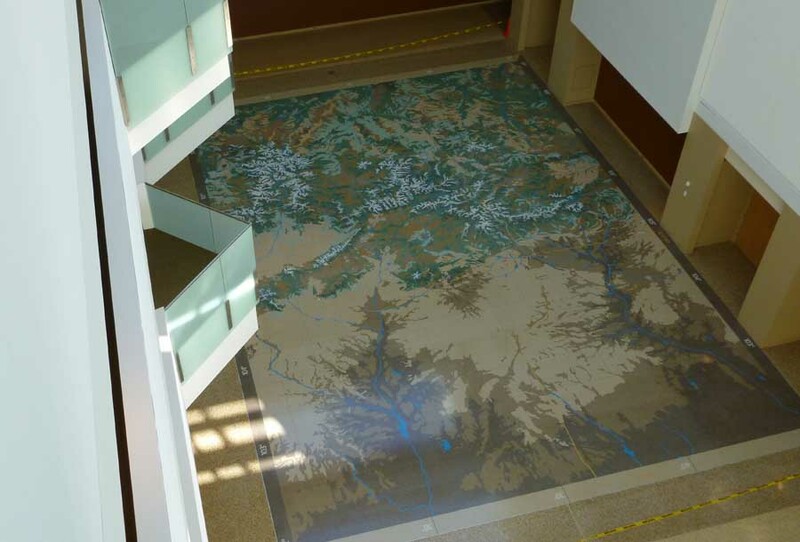 Museum visitors will walk across the beautiful floor while getting acquainted with Colorado’s topographical landscape, as seen from 400 miles above the earth. Replacing the former Colorado History Museum, the new and cutting-edge History Colorado Center is a 200,000-square foot museum which celebrates 10,000 years of Colorado and its people. The History Colorado Center is a Smithsonian Affiliate – one of only three organizations to achieve such an association in the state of Colorado. Opening exhibits that incorporate high-tech, multimedia experiences combined with historic collections both show and tell the rich story of the state, allowing the visitor to become part of the story. Choosing Weitzman was an act of intertwining history and art in itself—the renowned artist began his career in the mid-70s in Colorado. In the 1980s, Steven Weitzman, developed a unique process for casting terrazzo without metal dividers and invented FOTERA®. The durable material was workable for indoor or outdoor installations and can be used to create any image, with any color, at any scale. Weitzman has employed this elegant process in numerous projects throughout the United States. This innovative work of art is part of Colorado’s Art in Public Places program and is an integral piece of the museum’s first phase of the exhibition program. The Great Map of Colorado functions as both a public art piece and an interactive exhibition. Visitors will have an opportunity to push an H.G. Wells-inspired “time machine” across 12 different zones on the map to activate place-based stories from Colorado’s past. Radio Frequency Identification tags-guided “hot spots” will trigger the time machine to play a one-to-two minute program that combines film, music, and still images relating to these stories. 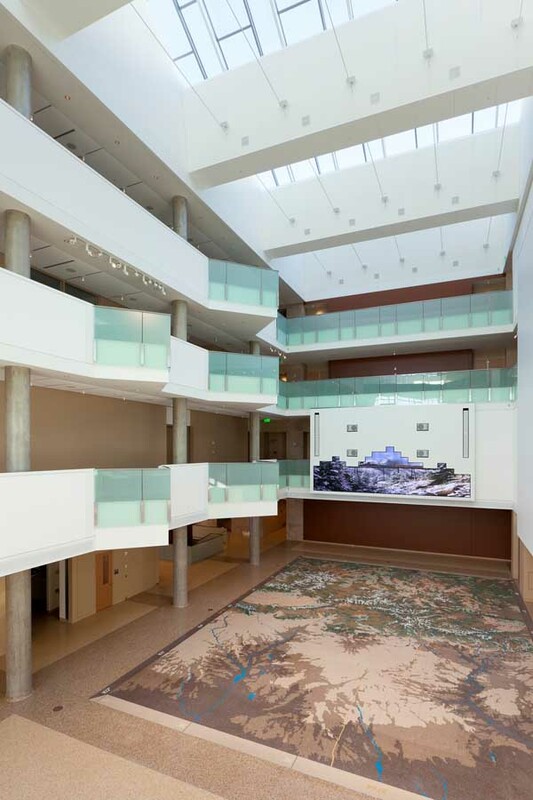 As a testimony to the excellence of this project, Weitzman will be presented with the prestigious “Art Special Award” by the National Terrazzo and Mosaic Association (NTMA). This honor is reserved for firms, architects and designers who have made substantial achievements within the concrete and art industries. The NTMA is the industry’s leading trade organization. Steven and this work with the History Colorado, will be recognized at an awards ceremony in 2012. The new History Colorado Center is located at 1200 Broadway in Denver. For more information visit www.HistoryColoradoCenter.org. For more information about Weitzman Studios or FŌTERA®, please visit http://www.weitzmanstudios.com or http://www.linkedin.com/in/stevenweitzman.